No one ever claimed that watching TV was healthy, but doctors are only now discovering just how bad it can be. Evidence from a spate of recent studies suggests that the more TV you watch, the more likely you are to develop a host of health problems and to die at an earlier age. TUESDAY, June 14, 2011 (Health.com) — No one ever claimed that watching TV was healthy, but doctors are only now discovering just how bad it can be. Evidence from a spate of recent studies suggests that the more TV you watch, the more likely you are to develop a host of health problems and to die at an earlier age. In a new analysis published this week in the Journal of the American Medical Association, researchers combined data from eight such studies and found that for every additional two hours people spend glued to the tube on a typical day, their risk of developing type 2 diabetes increases by 20% and their risk of heart disease increases by 15%. And for every additional three hours the study participants spent in front of the TV, their risk of dying from any cause during the respective studies jumped 13%, on average. "When put together, the findings are remarkably consistent across different studies and different populations," says Frank Hu, M.D., a professor of nutrition and epidemiology at the Harvard School of Public Health, in Boston, who coauthored the analysis. The increased risk of disease tied to TV watching "is similar to what you see with high cholesterol or blood pressure or smoking," says Stephen Kopecky, MD, a cardiologist and professor of medicine at the Mayo Clinic in Rochester, Minn., who was not involved in the research. The new analysis, he adds, "elevates the importance of the sedentary lifestyle" as a risk factor. “[TV watching] is not a good behavior for you no matter where you are in life, whether you're young or old," Kopecky says. Extended TV watching has reached epidemic proportions, especially in the U.S. Around the world, people spend more time engaged in this pastime than in any other activity except working and sleeping, but by one estimate the average American spends no fewer than five hours a day in front of the TV—more than Europeans and Australians. "That's a lot," Hu says. The connection between TV and disease isn't a mystery. TV watching eats up leisure time that could be spent walking, exercising, or even just moving around, and it has also been linked to unhealthy diets, including consuming too much sugar, soda, processed food, and snacks—foods, perhaps not coincidentally, that are often found in television commercials. Next page: The "couch-potato syndrome"
What's more, some studies suggest that prolonged sitting, over and above its impact on eating habits and exercise, may cause metabolism changes that contribute to unhealthy cholesterol levels and obesity. "This is really the couch-potato syndrome," Hu says. 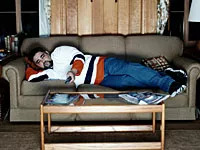 "These are extremely sedentary people who spend several hours on a couch watching TV. They're very passive and their energy expenditure is very low, even compared to other sedentary behaviors like sitting and reading, or sitting while driving." The studies Hu and his coauthor drew upon for their analysis included more than 175,000 people around the world and generally lasted between 6 and 10 years. Although the design of each study was slightly different, most controlled for a long list of health factors (such as body mass index, cholesterol levels, and family history of disease) in an effort to pinpoint the effect of TV watching. Extrapolating their findings to the entire U.S. population, the researchers estimate that for every two hours Americans spend watching TV each day, there are 176 new cases of diabetes, 38 additional deaths from heart disease, and 104 additional deaths due to any cause per 100,000 people per year. Individual physicians may not see a dramatic rise in illness and death as a result of excessive TV watching, but the cumulative effect could have a major impact on public health in the long term, Kopecky says. "Over time, we're going to see a difference."